In counterclockwise motion, remove plastic cap from end of syringe. Replace with mixing nozzle on to end of syringe and secure. Tray Method (For Best Results): Place small amount of gel into each tooth compartment of tray where sensitivity is felt. Use approximately one dose (1/4 syringe) per tray application. You may need less depending on the size of your teeth. Insert trays over upper and/or lower teeth. Remove excess gel with cotton swab or dry toothbrush. Normal wear time is 30 minutes. Remove trays and rinse trays with cold water. Rinse or brush excess gel from teeth. Brush-on Method: Apply a thick ribbon of gel to extra-soft toothbrush. Brush gel on to teeth, sweeping from gum line where most tooth sensitivity occurs. Do not rinse mouth or spit for approximately 3 minutes. After 3 minutes, spit any excess gel. Remove mixing nozzle and replace tip cap to avoid product leakage. For best results, do not drink or eat for 30 minutes after application. 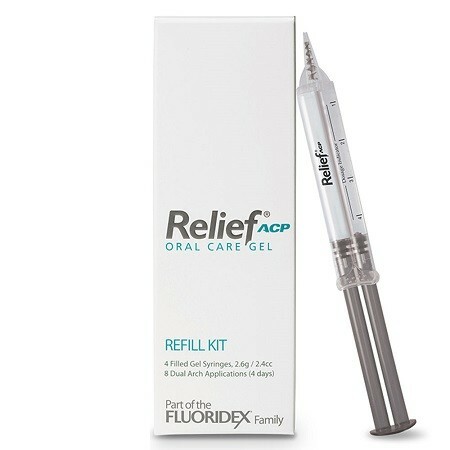 Use Relief ACP twice a day until symptoms are relieved or as directed by your dental professional. WARNING: Sensitive teeth may indicate a serious problem that may need prompt care by a dentist. Do not use this product longer than 4 weeks unless recommended by a dentist.